As RFOptic, we get many questions about Optical Delay Lines. Some questions are general in nature, while others are very specific. To help potential customers, we have complied the following list of frequently asked questions. Q: Let’s start with the basic question: What is ODL? Q: Where is an ODL used? A: ODLs are used for compensating delay differences in optical fiber systems in applications such as radar. Q: What does an ODL encompass? A: It encompasses high-performance lasers such as DFBs, optical modulators for high operation frequencies, and photodiodes. It can also incorporate other components such as optical dispersion compensators, optical switches, optical amplifiers and pre- and post RF amplifiers for exceptionally high performance. For various delays, the ODL optical system supports very high bandwidths of analog signals, high sensitivity with wide dynamic range. Q: How many delay lines can an ODL have? A: A standard Optical Delay Line can support up to 8 delay lines. Progressive ODLs can support up to 528 delay lines. Q: What is the difference between the two ODL types? A: In case of a standard Optical Delay Line, each delay line is formed using a distinct fiber spool. In a progressive (also called programmable or variable) Optical Delay line, each delay line is made by combining one or multiple delay lines. This means that a progressive ODL solution using 8 spools, and up to 256 delay lines can be created. This is transparent to the user. In each ODL type, the user simply switches between delay lines from the GUI or from the control panel. Q: Is it possible to create delay steps? A: Yes, this is a very common problem which is addressed by using P-ODL. For example, let’s say the user needs a delay line solution from 5 to 155 microsec delay in 5 microsec steps. In such a case, we would create an ODL using 6 distinct delay lines: 0, 5, 10, 20, 40, and 80. By combining one or more of these delay lines, all steps can be created. Q: Why would you need a 0 delay line? A: Some applications require 0 microsec delay line to use as reference. Q: When designing an ODL, what are the other issues to pay attention to? A: At higher frequencies, longer delay line dispersion becomes an issue. One or more dispersion compensating fibers (DCFs) may be needed to compensate for dispersion. Q: What is optical dispersion? A: Optical dispersion of long fibers at high RF frequencies cause additional insertion loss at specific frequency ranges per defined delay line length(s). That’s why an optical dispersion unit connected to the long delay line can compensate the unwanted dispersion loss. Q: How are the delays calculated? A: The delays are calculated based on the distance that the customer needs to simulate. For example, in a radar application, the customer may need to simulate a target that is 10 km away. That’s why the delay line calculation for that application must be based on the roundtrip delay factoring in the refraction coefficient of the fiber. Q: What is an Automatic Gain Control (AGC)? Q: How soon can an ODL solution be delivered? A: An ODL is a customized product that can be delivered (by RFOptic) within 4 weeks depending on the complexity of the system. We trust that the answers to these FAQ are helpful for organizations who want to learn more about ODL. 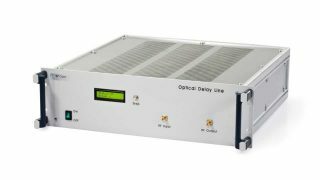 To learn more about RFOptic’s Optical Delay Lines, visit the ODL product page. To learn more or to discuss potential projects, feel free to contact Summit CSC in the US or RFOptic for more information.